That is what Brandon said when I asked why he was fishing with his left hand and why he was poking the fire with his left hand. There was a time when Brandon couldn't open his left hand. He has practiced with his left hand so much that he doesn't have a weak arm anymore! 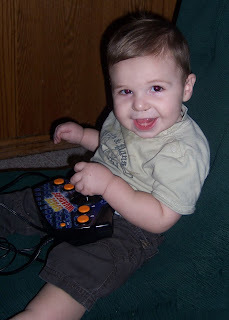 He suffered a right posterior cerebral stroke when he was 6 months old; he is 9 now. Hannah is our amazing 3.5 year old daughter. When she entered the (typical) preschool classroom in January, she became determined to climb the large rope "wall" on the preschool playground. She started out having trouble climbing up even a few steps and needed help getting down. But she is a determined little thing and worked at it each time her class went outside. Now, she can scale up and down that entire wall independently, and rather quickly (gripping with both hands, I might add!)!! Some of the 4 year old boys in her class can't even conquer that wall! We're so darn proud of her. Nothing will stop this girl. She even recently started being able to lift her body weight off of the ground while hanging with two hands from a bar! Hannah's in utero stroke was quite large (left middle cerebral artery), so watching her strength and agility when she climbs things is just beyond belief. 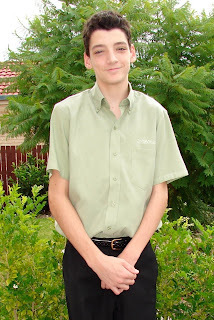 Over a year ago Joel applied for his first job at our local supermarket Woolworths. He had just turned 15 and was desperate to earn his own money and wanted to work. We were thrilled when they rang a week later to say he had been successful and would start right away. He was to work in the Delicatessen part of the supermarket serving customers, stocking meats, cheeses and salads and cleaning the area. He went in for his first shift and we thought he would be there learning in the background for awhile. We were surprised when he came home and said he had been serving customers 5 minutes in and was learning as he went. He found his own way of serving and for a while placing hot chickens in bags was difficult but he found a way around it. First jobs are a major part of growing up for most teenagers, for Joel who has had Left Hemiplegia from birth this was another milestone achieved and we could not have been prouder of our son. He is an inspiration to us and those he meets. While at work one day a woman asked if he had hemiplegia and said it was great to see him working as her young son also has hemiplegia and it gave her hope. Taylor is 20 months old and had a stroke when he was a few days old, while waiting for open heart surgery. 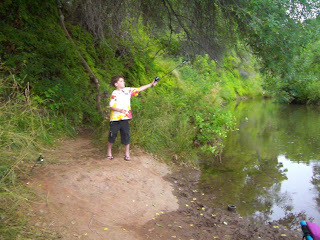 He was diagnosed when he was 8 months old when he wasn't using his right arm. Taylor is such a joyful boy and is always the favorite of all the doctors and nurses. He is always smiling and gets so excited when he learns to do new things. Lately Taylor has been trying so hard to walk. When he first started trying he would laugh so hard that he would lose his balance but he would get back up and do it again. He can take 4 to 5 steps now and he likes to climb up the steps to slides and climb down again. Taylor is truly an inspiration to everyone who knows him. I'd like to share a milestone moment with you; my little girl Aine (16 months) has learned to make the noises of three animals. If we ask her "What noise does a cow make?" she replies clearly, "MOOOOOOO!" She also knows cat and dog. This is a magic moment because it proves she is clearly understanding us, something we once feared might not happen. Aine had a stroke in the womb and was given a grim but uncertain prognosis. She was born with cataracts and hemiplegia and we were ready for the worst but every day she shows us that we were wrong to ever feel sorry for what had happened. Aine is a happy, lively and inquisitive child. 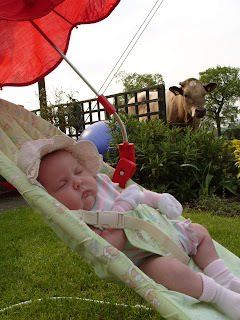 Here she is with the cow in question (although they're both older than this now)!